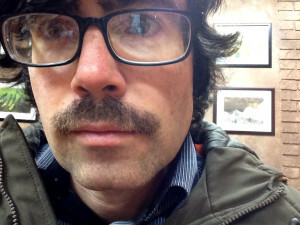 Jared’s moustache is keeping a journal for Movember. His name is Harry. 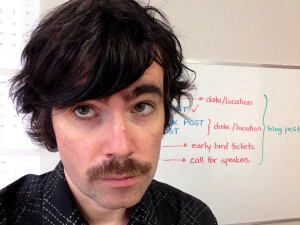 Here are his entries for Movember 16 – 20. You can read his earlier posts here, here, and here. A note to my new friends, lower lip and tongue. Your increased attentions, while not unwelcome, have been surprising these last couple of days. I realize that I am the new kid in town, and you are naturally curious. I’m happy that we’re more aware of each other and feel we will be bosom buddies. Please forgive the prickliness as I grow in. Jared says I’m in my awkward teenage phase. I have to admit, I am a bit spiky. I’m finding my way though. One does not simply become a great moustache. One must persevere. 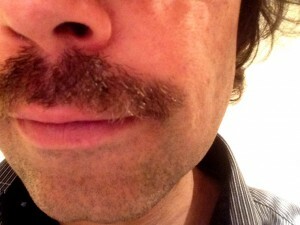 Here’s a quick video from Movember showing the stages we moustaches go through. It’s a journey. Today was a stay at home day. Beard got to peak out. Jared’s been mostly working on his computer all day. Upper lip is kind of glad I’m around. I shield him from some of the screen radiation. He appreciates it. Jared tweeted this picture to the place where he gets his hair done. He says things are getting out of control (and asked for an appointment). I don’t know though. 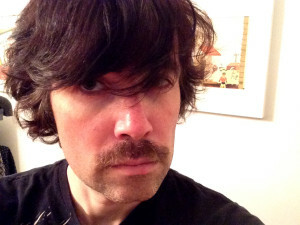 I think head is just doing his part to make Movember even hairier! I suppose a trim couldn’t hurt though. Here we are, waiting for pizza! In other news, Jared’s teammate (and boss-man) Colin and Jared went to a meeting today. They were the only two sporting staches, and someone made an allusion to something called Starsky and Hutch. Jared thought that was funny. I don’t know what Colin’s moustache’s name is. Jared says it’s weird to ask, but I’m curious! 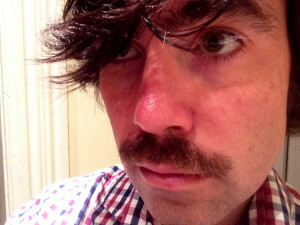 Do you want to help Harry reach his (extended) $300 fundraising goal to help promote men’s health? Make a small donation!